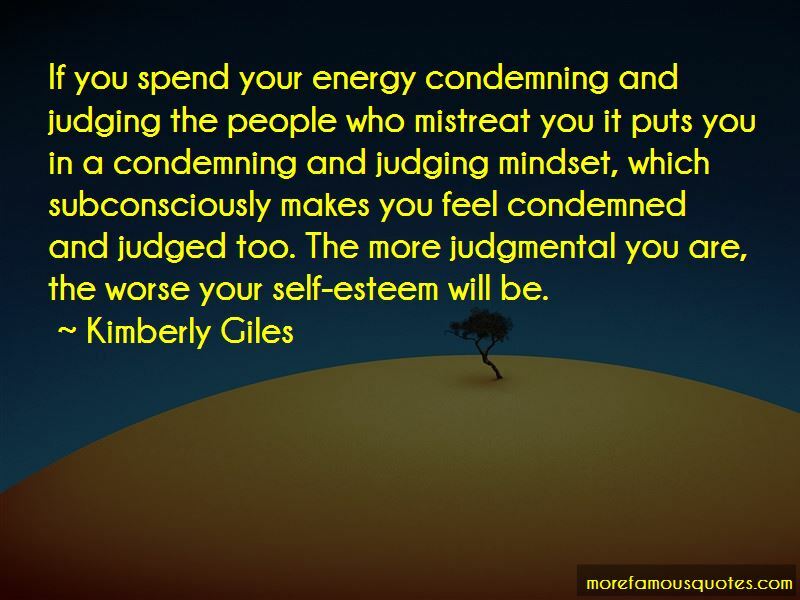 Enjoy the top 58 famous quotes, sayings and quotations by Kimberly Giles. “The world needs people who have survived mistakes, tragedies, and trials to help the rest of us through. Where would we be if Victor Frankl had never experienced what he did during the war? He wouldn't have used his experiences to benefit millions of people around the world. There are two forces in the universe: fear and love. Trust is part of love because it makes you feel safe, and it is only in this state that you are capable of love. “It is important you understand how fear affects you and how it drives human behavior so you can start to see situations and people accurately and respond more appropriately. When someone is behaving badly, attacking you, or being defensive, critical, or judgmental, it is not really about you. Fear is the real reason people behave badly. Their fears make them selfish, defensive, mean, and grouchy. Every time someone is behaving badly, step back and ask yourself, "What is this person afraid of? What fear inside me is driving my reaction to their attack? What am I afraid of?" Claritypoint: No one can see your value unless you believe it first. “Fear has to be the opposite of God because it is the opposite of love. Fear is selfish, needy and focused on you. It makes no sense for God to want you in fear about Him or your life. “I say this because all religions, accurately understood, will take away your fear of not being enough. I believe there is a way to understand the tenets of your religion, right now, that will take away your fear and make you feel loved and safe. The problem is that no matter what you believe or to which religion you belong, there are two ways you can experience your beliefs. There is a fear way you can experience your religion, and a love way to experience it. All religions can be experienced both ways. All life philosophies can be experienced both ways too. If you don't consciously choose trust and love in each moment, your subconscious policies will choose for you, and they usually choose fear. If life is a classroom then you're still in the learning process part. In the learning process part, if you make a mistake you can just erase it and try again. In a classroom your mistakes deserve course correction and education, not punishment. Here the goal is to teach you how to behave better, not to fail or get rid of you. In a classroom, you can be a work in progress, and that's okay. In a classroom, you are free to make mistakes in order to learn, because mistakes are part of learning. There are still consequences to every choice, but in a classroom you can't fail, because your value isn't on the line. If life is a classroom, you have the same value no matter how much you struggle, how many mistakes you make or how you perform. If life is a classroom you are safe. Remember, if you don't consciously choose trust and love, you are unconsciously choosing fear. Start watching out for any thoughts or feelings that are immature, angry, inaccurate, selfish, weak, scared, dramatic, or in any way based in fear. In those moments, start to practice consciously choosing love for yourself and others instead. You cannot be diminished by what other people think of you. Your value is infinite and absolute. It does not change. What other people think of you is irrelevant. 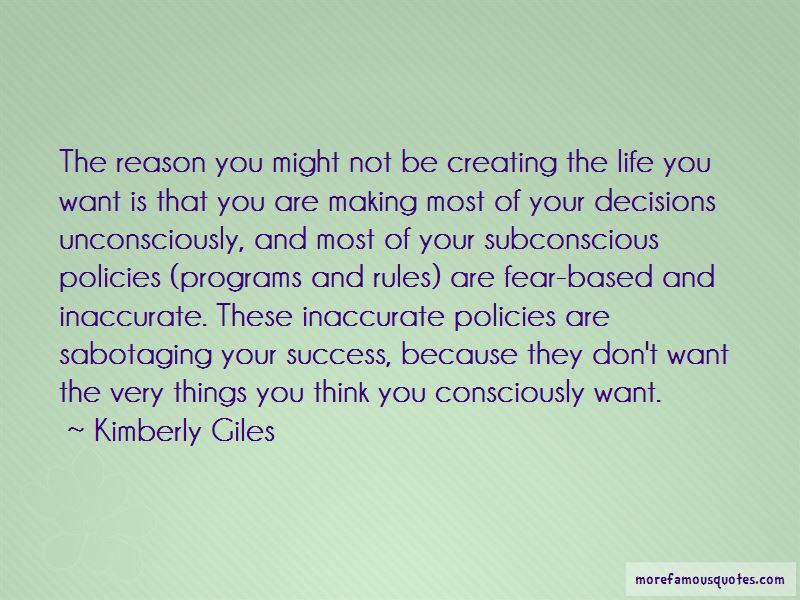 Want to see more pictures of Kimberly Giles quotes? 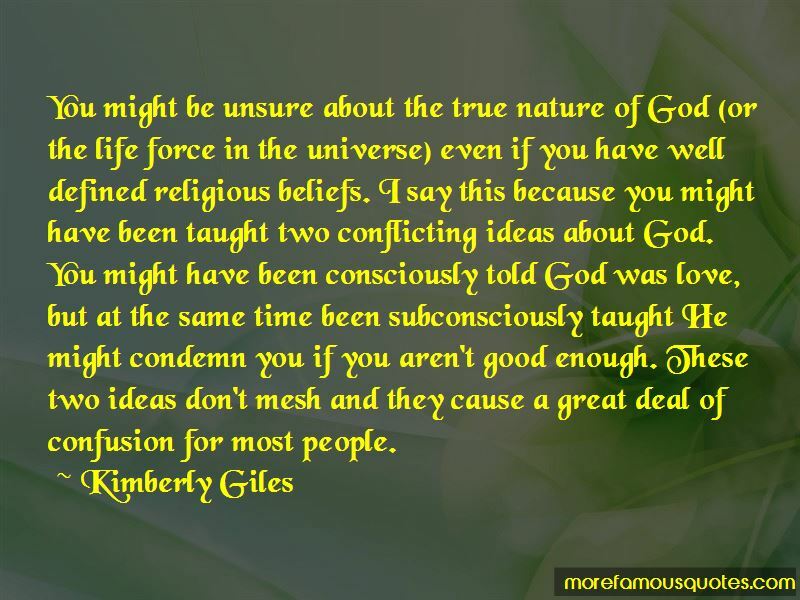 Click on image of Kimberly Giles quotes to view full size.